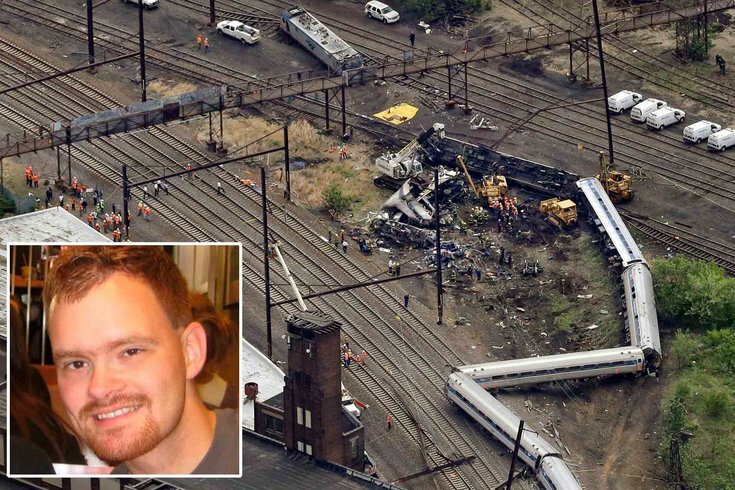 Brandon Bostian, inset, who was operating the Amtrak train that derailed in Philadelphia on Tuesday night, has been an Amtrak engineer for four-and-a-half years, according to his LinkedIn profile. Attorneys representing 27 victims of the Amtrak 188 crash questioned Monday the credibility of Engineer Brandon Bostian, claiming his remarks given to investigators in a pair of interviews contain inconsistencies. Earlier in the day, the National Transportation Safety Board released two interviews its investigators conducted with Bostian, who was operating the train when it derailed in North Philadelphia last May, killing eight people and injuring more than 200 others. The interviews – conducted May 15 and Nov. 10 – are part of more than 2,000 documents included in the NTSB's accident docket. Investigators will use that trove of information to determine the cause of the crash, a conclusion that is not expected for several months. But attorneys Robert Mongeluzzi and Tom Kline, combing through that information Monday afternoon, immediately questioned Bostian's responses in those interviews. When interviewed in May, Bostian told NTSB investigators that he could not remember anything beyond passing the North Philadelphia train station. But during the second interview in November, Bostian recalled more details – but not all – regarding the events leading up to the crash. "His change of testimony in this case is extraordinary," Mongeluzzi said. "After months passed after the accident, he now has a sudden memory. That, for the victims of this derailment, is going to be a bitter pill to swallow." Bostian recalled exiting a 65-mph curve and entering a 80-mph straightaway that precedes the 50 mph curve on which the train derailed, according to his Nov. 10 interview. He told investigators he accelerated into the straightaway, but mistakenly targeted 70 mph. He then hit the throttle to reach 80 mph. "And I don't remember anything from that point until after the train was already in the curve. "And again, with that memory of bringing the train to 70, realizing a mistake and then making an attempt to bring the train from 70 to 80. There's a very good possibility that could have occurred on a previous trip because that sort of mistake is something that could have happened on any trip. "So I don't know. I can't tell you with accuracy, with certainty that that was on the night of the accident. But in my mind, that's what I believe. That's when I believe that memory was from." Investigators believe the train reached 106 mph before someone applied an emergency brake that slightly reduced the speed before the train entered the curve. Bostian also recounted a radio conversation he had with a dispatcher who informed him a SEPTA engineer had reported rocks hitting his windshield in the area. Kline said that could have served as a motive for Bostian accelerating the train. "He was operating the train, knowing where he was," Kline said. "He went into that curve knowing what he was doing. But he sure wasn't going 70-to-80 mph – we know that as well." Other documents included within the accident docket revealed no problems with the locomotive, train tracks or brakes, Mongeluzzi said. "What we have learned is the problem was Brandon Bostian," Mongeluzzi said. "The problems remain his changing story, which started with 'I have no recollection, whatsoever.' Now, it becomes, 'I have memory of what occurred, but I mysteriously have a gap, as well.'" Bostian's lawyer, Robert Goggin, did not immediately respond to a message seeking comment. Goggin told ABC's "Good Morning America" in May that the engineer's memory was likely to return, saying it was impacted by a concussion. But Mongeluzzi said a jury is likely to conclude that this resurgent memory was "convenient," noting that one victim who interacted with Bostian immediately after the crash described him as lucid. "We also know that he refused to answer questions to the police and asked for his lawyer," Mongeluzzi said. "That is the hallmark of somebody whose wits are about him. We do not believe at all that he had a medical condition that mysteriously allowed memory to seep back into his head. We believe that his inconsistent story speaks volumes about him and his credibility and believability at trial." Both Mongeluzzi and Kline both faulted Amtrak too, pointing to its failure to install Positive Train Control technology along the curve as an "institutional failure." Yet, Mongeluzzi and Kline said they had limited time to review the documents before addressing reporters at 2 p.m. – one hour after the NTSB made the accident docket available to the public. They had a team of about 12 people poring over the information as they spoke to the media. "It's a starting point for us in a long road and a long investigation into what really happened here," Kline said. "We don't profess in the first hour to know everything. ... We obviously focused in on Mr. Bostian's statements. A first read of it tells us immediately that the statements are inconsistent." The law firm of Saltz, Mongeluzzi, Barrett and Bendesky represents 17 passengers injured in the Amtrak crash. Kline and Specter represent another 12 victims, including two death claims – for Rachel Jacobs and Bob Gildersleeve. Amtrak's rail liability originally was capped at $200 million for compensatory and punitive damages. That cap has been bumped to $295 million, but Mongeluzzi said total claims are likely to exceed that figure.